The Sasquatch Music Festival was not the only one that took place during the Memorial weekend. The East coast also shared its portion of music inspiration during the Boston Calling Music Festival. Let’s take a brief review at the fashion highlights presented by the local fashionistas at the event. Oh boy, where do we start!? Well, apparently it was colder in Boston, than in was in Washington, however, despite the abundance of outerwear, some went for radical looks. Like this girl who opted for scarlet red shorts with polka dot black tights and above knee stockings with awesome boots. Another thing about her look is the orange ombre hair and a blue crossbody bag that make the overall impression really good. Other girls were more conservative, and perhaps thinking of not getting cold while choosing their outfits. Like this girl was wearing an animal print coat with beige scarf. She wasn’t the only one with a coat as many preferred to dress to the weather. 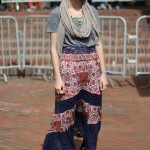 Of course what music festival would be without maxi-skirts? 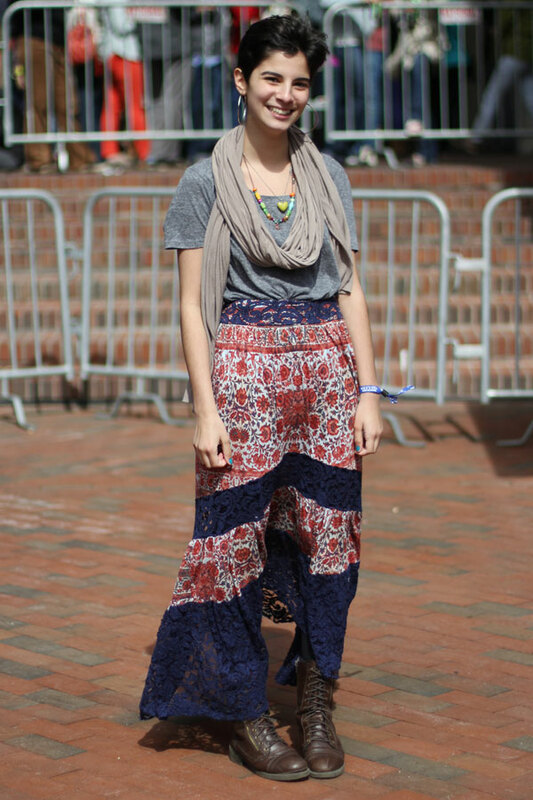 This girl opted for a maxi-skirt with floral pattern and accessorized with a huge scarf and funky necklaces. 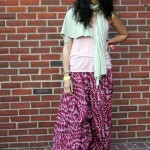 Patterns were quite popular especially on those who were wearing maxi-skirts or maxi-dresses. 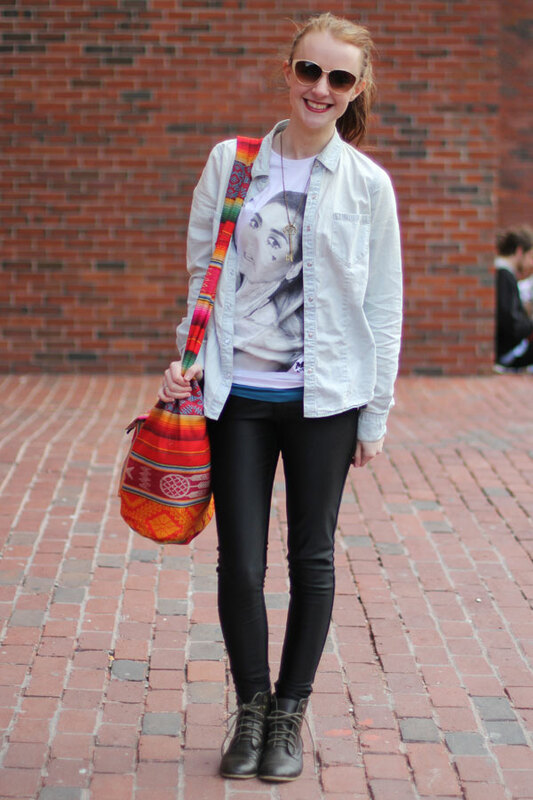 Not to say that there were abundances of bright hues, but some opted for brighter tones, like this girl who accessorized her subdued outfit of black pants and blue denim jacket with a vibrant orange bag. There were lots of leggings, denims, mini-dresses, scarves and cardigans. Now another stealer of attention is the girl that stunned with the crocheted overlay on a beautiful short sundress. 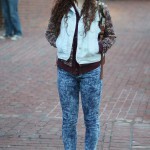 She completed the look with a denim jacket and awesome leather boots. Now, have you picked your favorite look? What do you think in general about the street style looks present at the event?